Granola has been on the cards at the Breakfast Adventure Club for a long time now, so when our friends over at The Good Granola Co. sent us some samples of their new line we were really excited to try them. 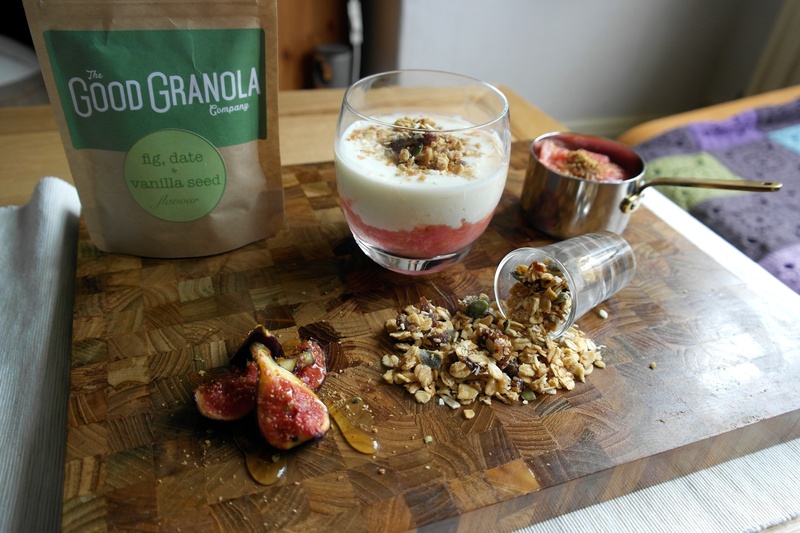 This easy to make rhubarb compote goes great with yoghurt and granola, and The Good Granola Co. fig, date and vanilla seed mix provides a perfect balance to finish off this tasty breakfast treat! 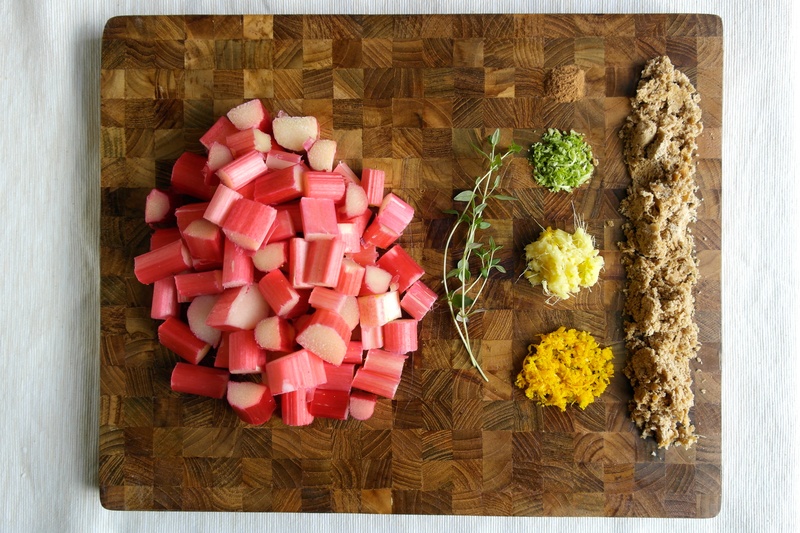 Chop the rhubarb into 1cm pieces, and put in a pot. Grate in the zest of 1/2 an orange, and 1/2 a lime, and a thumb sized piece of fresh ginger and add 1tsp of cinnamon. Add 20g of dark sugar. Squeeze the juice from half an orange on top. Finally, add the sprigs of thyme, and mix everything together. Put the pot on a low heat, and stir often. Cook for about 15 mins, or until the rhubarb is soft. It will release a lot of moisture! When it is cooked, take off the heat and allow to cool a little. While the compote is cooling, heat up a griddle pan or skillet. Quarter up a fig and cook flesh down on the griddle. This will only take a few minutes! To assemble, layer compote, yoghurt and granola in a bowl or glass. 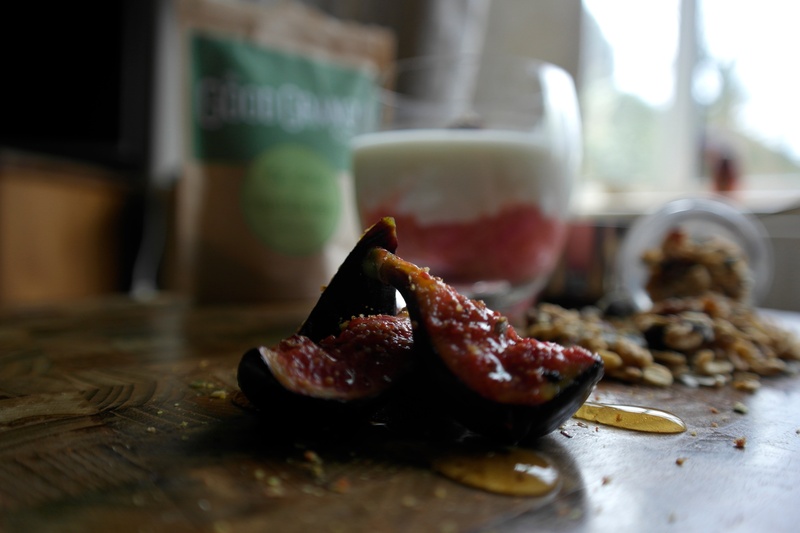 Serve the fig on the side with a drizzle of honey and a sprinkle of seed mix. If you liked this recipe, head over to The Good Granola Co. for other interesting things to do with oats! Oh this looks like something you’d order in a fancy breakfast bar. Very nice!